There’s nothing like a gooey brownie, right? 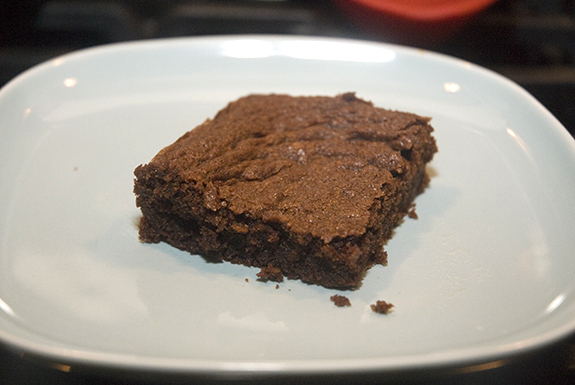 These taste a lot like the store bought boxed brownies, only they’re homemade! If you’re craving chocolate and you’re one for nostalgia, these are pretty awesome. 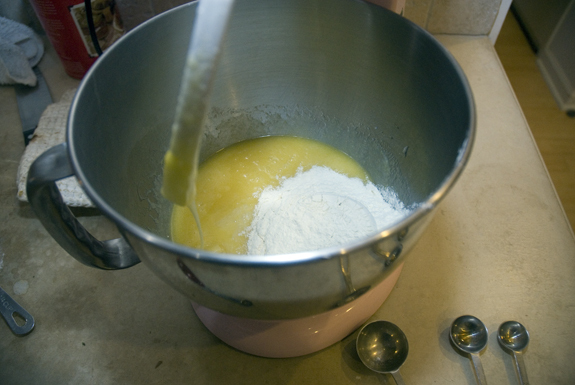 Toss everything into a mixer. Mix it up! You’re done! 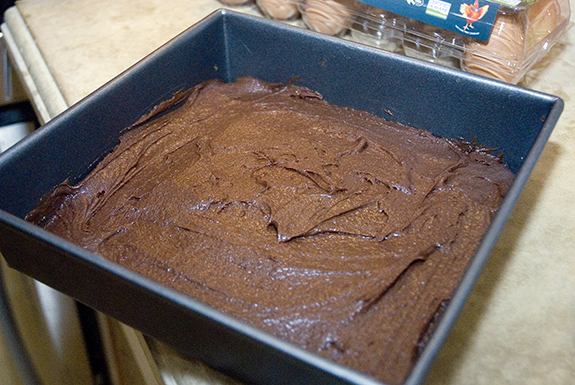 Pour the brownies into a pan. There aren’t many! However, I did noticed that my brownies were a little thin. That might annoy some folks, but I think it just makes them even more like the box variety. Check the brownies after 20 minutes. Mine were a little on the gooey side. They did cool really well, however. So, just check them to make sure you’re cooking them all the way through. I bet you could cut the butter in half and substitute half a cup of apple sauce. I haven’t tried this, so I don’t know what that will do to the taste but it will make them a leeetle bit healthier, if that’s something you care about. If you’re a fan of nuts (and we are!) add in some walnuts. I might also suggest some chocolate chips. As usual, please let me know if you have any comments or suggestions! Previous Post Please Don't Blush. I’m so glad that you wrote this post! I was actually contemplating a post on my food blog about why homemade brownies simply aren’t as gooey and fudgy as that heavenly boxed kind you get from the store. I’ll be trying this recipe out very soon as I ADORE brownies! 2. I generally use 4-5 eggs and a less flour 0 like a cup. The more eggs you use, the less flour you need. 3. I gave up on cocoa powder – its too dry. I use 3-4 oz of baking chocolate. I put a small pot of water on the stove and set it to simmer. Then I just put my mixing bowl with the chocolate and butter on top and check back every so often – it melts magically. 4. I’ve varied the butter from 1/2 bar to 2 bars. I think 1 bar works best, and you can work a recipe down to 3/4… but anything more or less just doesn’t have the right texture. If you want to cut down on butter, then do the straight vegan versions… they come out bad when you try to compromise. 5. If you use 1stick butter + baking cocoa, and go for gooey not cake-like, you generally don’t have to grease the pan. 6. To bring out the chocolate flavor, I’ll toss in a tsp or two of instant coffee… or a shot of espresso/moka/cold brew coffee. 7. If you want to go crazy, you can drop a few frozen raspberries or cherries into the pan. Figure out the ‘grid’ you’ll cut them into, and then aim for the center of each square. You can also put some peanut butter in a double boiler to melt, drizzle on top, and then use a knife to do criss-cross wave patterns into the batter. delicious. I find the best brownies to be almost flourless, where they are kind of like a chocolate custard with crispy top and bottom, but gooey insides. If you’re going eggless, try using a bit of the silken tofu that is pureed into a smooth cream in addition to the applesauce. Mihow, my dear, I am dying to know: what do you do with all of these amazing baked goods?! I love to bake, but end of sending most of what I make to my hubby’s work. We just can’t get through it all at home. Just curious as to how you handle the large quantities of delicious treats? The whole family ate the bread and the pancakes and the biscuits. The brownies? I ate most all of them and I am not at all proud of that. In fact, last night I was going to make more and then I realized that the entire pan is probably around 6,000 calories. Needless to say, I did not make another batch last night. Sounds like you’ve got it under control. I always feel bad wasting things I bake since I buy all organic ingredients and it is expensive. But my waistline feels bad if I eat them. Hmmm. First world problems. I forgot to mention that there was this one time I baked the red velvet cupcakes and was actually begging moms to take them from me on the playground. They are not the group who wants to eat a bunch of cupcakes. I should have stood next to the guy selling “Tobacco Pipes” on the sidewalk.